Neptune, the most distant planet in the solar system, is in opposition in Aquarius on August 22, but you can find it most easily starting from Capricornus. Neptune, the most distant planet in the solar system, just completed its first trip around the sun since its discovery in 1846 and will reach a point in its orbit called opposition on Monday (Aug. 22). A planet is said to be in opposition when it is exactly opposite the sun in the sky. This usually means that the planet is at its closest to Earth for the year, and also appears at its brightest to observers. At these times, the planet also crosses the local meridian at midnight, and is visible all night long. In binoculars or small telescope, Neptune appears as a tiny spot of blue-green; the only thing that makes it stand out from the stars behind it is its unusual color. The sky map of Neptune here shows the location of the planet during its opposition. Because of its faintness, finding Neptune can be a challenge. Although it's located in Aquarius, this is a faint constellation, hard to spot especially in the city. A better way to find it is to star-hop from neighboring Capricornus. How do you tell an astronomer from an astrologer? Astronomers call Capricorn "Capricornus" and Scorpio "Scorpius." Although Capricornus is also a faint constellation, its stars fall into an easily recognized triangular outline. It is located just to the left of the "teapot" of Sagittarius for observers in the Northern Hemisphere. Aquarius is just to Capricornus' left, but we don’t need to go that far. Look for the upside-down and slightly lopsided triangle of Capricornus. 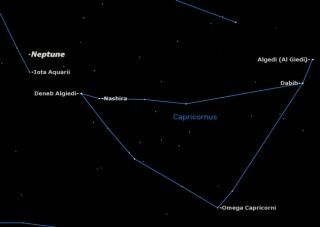 The left and right corners of Capricornus are marked by wide pairs of stars: Dabih and Algedi on the right, and Deneb Algiedi and Nashira on the left. These last two stars are our key to finding Neptune. Draw an imaginary line from Nashira to Deneb Algiedi and extend it three times its length to the left. This will take you to the 4th magnitude star Iota Aquarii. Continue that same distance directly above Iota Aquarii and you will find Neptune. According to a NASA data sheet, the average distance between Neptune and Earth during the gas giant's opposition is about 2.7 billion miles (4.3 billion kilometers). When not at opposition, Neptune's average distance from the sun is about 2.8 billion miles (4.5 billion kilometers), roughly 30 times the Earth-sun distance. The Earth is about 93 million miles (150 million km) from the sun. How will you know if you've found Neptune? If you have a large telescope, you will see it as a tiny disk if you magnify it 200 times. Otherwise, make a careful sketch of its position among the stars, and check again another night: Neptune will have moved. Why go to all this trouble to find tiny Neptune? Well, with Saturn setting right after the sun and Jupiter not rising until after midnight, you may be suffering from planetary withdrawal: right now Neptune is the only game in town for planet watchers.